Being able to recognize the signs of an overdose quickly and having a naloxone kit can save a life. Naloxone can buy time while paramedics are en route. Take-home naloxone kits do not replace the need for emergency care or minimize the importance of calling 911. You can get a take-home naloxone kit for free from pharmacies and other agencies in the Wellington-Dufferin-Guelph area. A health card is only needed if you are receiving a kit from a pharmacy. Pharmacies offer injectable naloxone only, where other sites offer nasal naloxone. When you get your kit you will also receive training on overdose prevention, recognizing an overdose and how to respond. Below is a list of places where you can get access to a free naloxone kit. Provides free kits and training for injection drug users, their family or friends, or those recently released from a correctional institution. No appointment is required. Community Health Van, in partnership with Sanguen Health Centre and ARCH, provides naloxone and other harm reduction services. Operates Wednesday and Thursday nights in the city of Guelph. Wednesday nights: call or text 226-971-3957 for times and locations. Call the Drug and Alcohol Helpline at 1-800-565-8603. Check this list of pharmacies that have naloxone. This list is managed by the Ministry of Health and Long-Term Care. Should a pharmacy be missing from the list, please contact the Ministry. Once you have located a pharmacy, it is recommended to call ahead to make sure that they currently have naloxone available. Bring your health card to obtain naloxone free of charge. Services provided in Guelph, Wellington, Dufferin, Grey and Bruce. Visit 176 Wyndham St., Guelph (basement of Guelph Community Health Centre), Monday, Wednesday, Thursday and Friday, 9 a.m. - 4 p.m. Provides overdose prevention training and naloxone kits to anyone who is concerned about opioid overdose in our communities. You do not need to use drugs to qualify. To sign up for training, contact Michelle Steingart with your name and contact information. To register, you can call the Sanguen office toll-free at 1-877-351-9857 or email Michelle at info@sanguen.com. 176 Wyndham Street North, Guelph. Open 7 days a week from 10 a.m. to 5 p.m.
176 Wyndham Street North, Guelph. 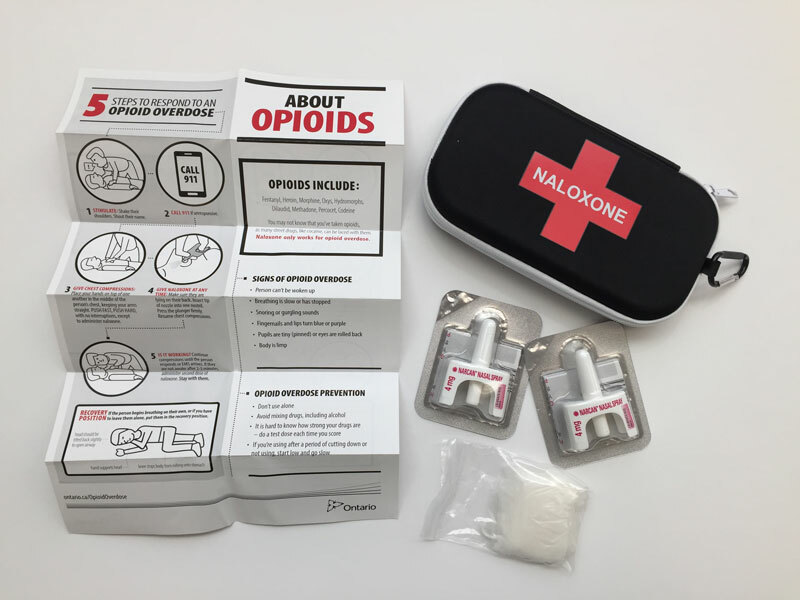 Monday to Friday, 10 a.m. – 5 p.m.
Visit Resources from Opioid Overdose Awareness and First Aid Training for opioid information and a list of pharmacies in Elora, Fergus, Guelph and Palmerston that carry naloxone.